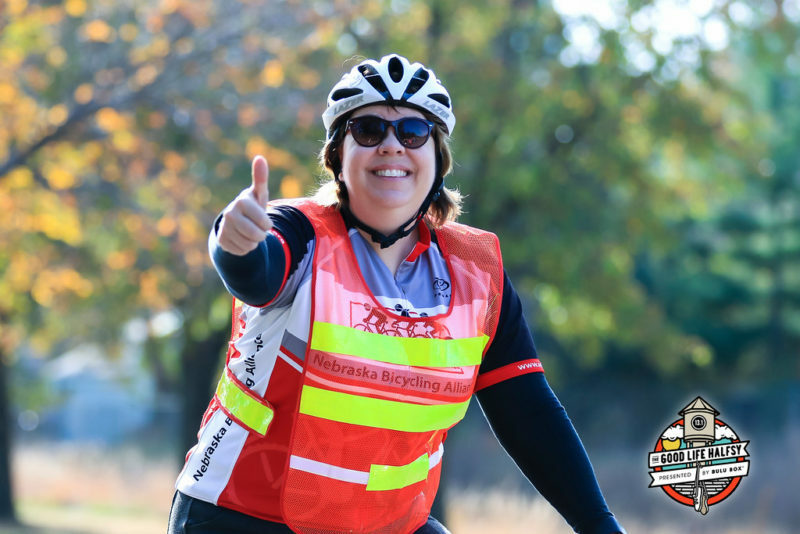 The Nebraska Bicycling Alliance was happy to provide the on-course bike support for the 2016 Good Life Halfsy. Just like last year, we came away inspired by the collective determination of 6000 people on very personal journeys, striving to achieve a common goal. We love your exuberance, watching you encourage each other and singing along with the music in your headphones. We love the quiet determination and grit we see on your faces that takes over at mile 11, and then seeing that look change to glee as you hit the downhill on the bridge leading to the Haymarket. You are amazing! Our job out on the course is to have your back: we guide the leaders to make sure they stay on course; we are ready at a moment’s notice to call for help if we see someone injured; we do our best to nudge you away from the inside edge of the lane along Normal to keep you safe; we provide encouragement and try to keep your spirits up; we bring up the rear to make sure that nobody gets forgotten. And although our name only has the word “bicycling” in it, we have your back as an organization, too. NeBA’s mission is to cultivate a safer, more bicycle friendly Nebraska through partnerships, education, and advocacy. The key word there is “safer,” and it is something that we take very seriously. We advocate for safer roads, safer streets and infrastructure like trail connections and bike lanes and off road trails in parks. We encourage people to bike for fun but also for everyday transportation. We encourage kids to walk and bike to school. We educate decision makers on laws that can help keep us safer. We are currently providing technical assistance to the Nebraska cities participating in the state’s Walkable Communities project. If you look closely at that list, you’ll notice that much of what makes bicycling safer and more enjoyable also has the same impact on runners and walkers. Truthfully, NeBA’s constituents aren’t just bicyclists, they are active people just like you. We’ve got your back. In fact, we can envision a future where the Nebraska Bicycling Alliance becomes the Nebraska Walking and Biking Alliance. Hopefully the ice and ibuprofin and band aids are doing the trick in these first post-event days. May we go so far as to encourage an easy bike ride as active recovery from the 13 miles of pounding your joints took during the run? We promise it will make you feel better.